Well do I remember our first show and the question of what to do for CAGE CURTAINS ~ Following are instructions for simple but adequate cage curtains with minimal sewing required! Be sure to purchase the standard 45" wide fabric. Choose colors/patterns to suit your personal taste, and think about colors ~ don't use dark colors for a black cat or colors that will clash with you beautiful red tabby kitty. I suggest finding two or three coordinating fabrics, but it is fine to use just one if that is your preference. You might consider bordered fabric ~ this creates a decorative touch with NO EFFORT on your part. Cotton is probably least expensive and easiest to care for. And watch for those Fabric Sales!!! I recommend you request the exact yardage for each piece and have the fabric store do the cutting for you. For the cage itself you will need 3 yards (108 inches) of 45" fabric, this will cover both sides and the back of the cage. For the top of cage purchase 1 2/3 yards (60 inches) of coordinating fabric & for the table covering purchase an additional 1 2/3 yards (60 inches) of fabric ~ this could be the same fabric as your top, or a third coordinating fabric. You will also need some padding for the table under the cage ~ this could be samples of carpet, a piece of ¼ inch foam or some pre-quilted fabric, or even an old mattress pad cut to size ( it doesn't matter if it matches or not, because it will be covered by the table fabric). Now the hardest part ... You will need to put a rolled ~ or ¼ inch hem on all raw (unfinished edges) of the cut pieces of fabric. If you wish you may add ruffles to the edges of the top fabric and to the front bottom of the table covering ~ but this is not necessary. Next, you will need to open the cage top ~ NOTE: the cage top is hinged in the front allowing it to open up and fold down toward the front of the cage ~ the side with the two doors. ~ Now, simply drape the cage curtain fabric (3 yards) over the sides and back of the cage ~ there should be fabric hanging on both inside and outside of the cage, on all three sides. Cages vary in size, but this amount of fabric should be generous ~ just "gather" the excess evenly around the three sides of the cage. Fold the top back in place and "hook" the corners. You will probably want to use a couple clips to secure the top in place. (The metal office paper clips with the folding tops work great.) Now center the top fabric over the top of cage leaving a couple inches hanging down in front, and the excess fabric hanging equally down on the outside of each side and the back. Lift the cage onto the table over the padded and draped benching area. 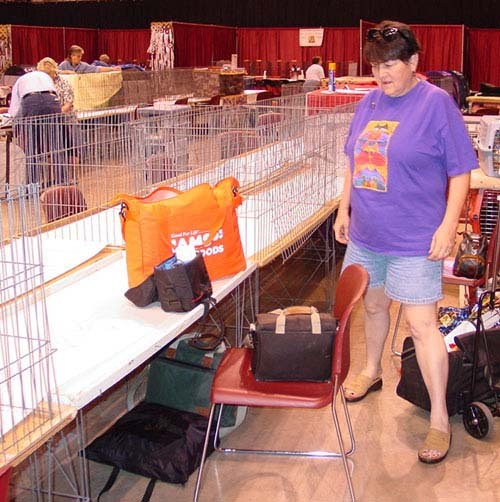 Viola' ~ Just add food and water dishes, a couple toys and your cat of course and you're ready for a great day at the show!!! 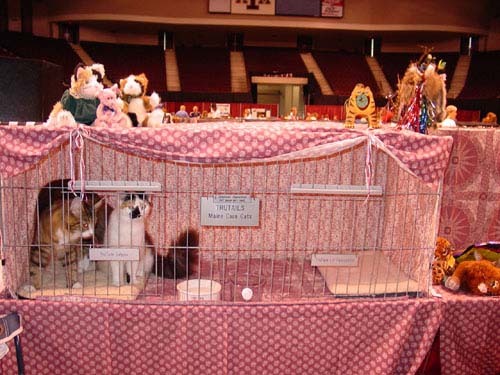 If you wish you may add decorations to the top of the cage ~ some shows have a theme and it's fun to coordinate with the show theme, or the season or whatever suits your personal taste. 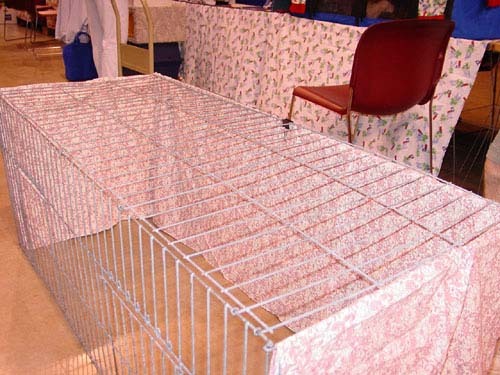 If you have purchased a grooming space you can easily cover it as well ~ all you will need is 2 pieces of 1 2/3 yards of fabric each ~ one to cover the table and the other to cover an extra wire cage folded flat and propped against your cage. 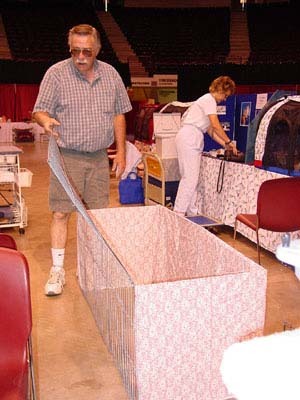 There are usually people who use their own cages so there should be extra cages available, just ask your show manager. 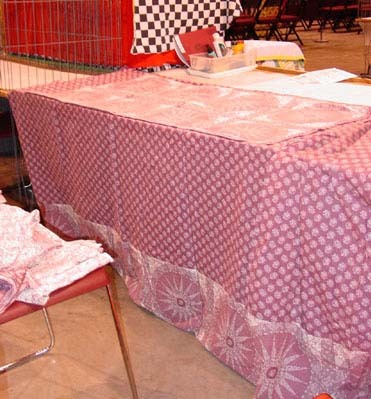 Another possibility ~ I have seen people use tablecloths (checkered picnic variety), flat sheets or beach towels for cage curtains. Anything will work, and if you are just starting out you may want to go this route until you decide how you want your benching area to be decorated. Please, do NOT be bashful ~ let the person benched next to you know this is your first show ~ most people are happy to help out a newcomer. We all remember our "first show!" Also it is a good idea to alert the show manager or entry clerk that you are a "newbie" and they will most likely make sure you have assistance if desired. Remember, this is a hobby ~ we are all here because we love our cats and showing them off. Most important HAVE FUN!!! I hope we see you at the show.